The 'Culture Of Corruption,' Redux : It's All Politics Democrats took over Congress in the 2006 elections for an assortment of reasons, one being the "culture of corruption" during Republican reign. Now there are some ethics questions about Democrats too. Back in 2005, when things were much different from what they are now -- Republicans controlled both the White House and Congress and, even more dramatic, Political Junkie was a weekly column -- Nancy Pelosi had a favorite catchphrase: the ongoing "culture of corruption" in Congress. It was not just the corruption. The war in Iraq and the government's response to Hurricane Katrina were big factors as well. But Election Day 2006 brought Democrats to majorities in both houses of Congress, made Pelosi speaker of the House, and set the stage for Barack Obama's election as president two years later. And what of the issue of corruption? I'll let you decide. For the record, this isn't a game, or a contest, over which scandal was worse, or which party was or is more corrupt. The goal here is not to compare 2005 to 2009. We don't even know if what's going on now will reach the "scandal" level. But there are some troubling things worth discussing. Back in November, federal investigators raided the offices of the PMA Group, a major D.C. lobbying firm, as part of an investigation into alleged improper campaign contributions. PMA is known for helping clients receive multimillion-dollar earmarks from congressional legislation. The firm has close ties to Rep. John Murtha (D-PA), a powerful member of the powerful House Appropriations Committee who for more than three decades in Congress has helped direct projects and largess to his district in western Pennsylvania. PMA founder Paul Magliocchetti once worked for Murtha on the Appropriations Committee. According to Taxpayers for Common Sense, Murtha arranged $38 million in earmarks for PMA clients in the past fiscal year. The firm's executives and clients are among Murtha's biggest sources of campaign contributions. Another firm, the defense contractor Kuchera Industries -- located in Murtha's hometown of Johnstown, Pa. -- was also raided, in January. Kuchera has received millions of dollars in defense contracts over the years. It too has close ties to Murtha. The New York Times' David Kirkpatrick writes that federal prosecutors are looking to see if PMA "may have funneled bogus campaign contributions" to not only Murtha but two other Democratic House members, Jim Moran of Virginia and Peter Visclosky of Indiana. A Murtha spokesman has said the congressman is not a target of the investigation and the two raids do not involve him. That may be so. But everyone is aware that both raids were on entities with close ties to Murtha, whose own ethics questions date back to the Abscam scandal of 1980, when he was approached by FBI agents posing as businessmen offering bribes and who said, on videotape, "I'm not interested -- at this point. If we do business for a while, maybe I'll be interested, maybe I won't." 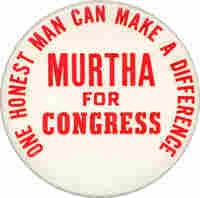 Unlike six other House members who were indicted and convicted in the scandal, Murtha escaped both. Republicans of course would love to see Murtha fall. Once a strong supporter of the 2002 measure that authorized President Bush to wage war in Iraq, Murtha did an about-face on the war in 2005, which endeared him to Pelosi and earned him the enmity of conservatives. In 2006, after the Democrats won control of the House, Pelosi supported his bid for majority leader (in which he lost badly to Maryland's Steny Hoyer). Republicans hoping to seize the ethical high ground from Democrats are already salivating at the prospect that a key ally of Speaker Nancy Pelosi (D-Calif.) may be in trouble. "The signs that Rep. Murtha may be hiding serious ethical problems are clearer every day, but Speaker Pelosi continues [to] turn a blind eye to the news about her hand-picked choice for House Majority Leader," Michael Steel, spokesman for House Minority Leader John Boehner (R-Ohio), said in a statement. "Despite their campaign promises, the Democratic Leadership is still more interested in sweeping ethics problems under a rug than 'draining the swamp.' "
A senior House Democratic aide shot back: "Taking ethics advice from John Boehner with Jerry Lewis (R-Calif.) and Don Young (R-Alaska) under federal investigation is like asking his advice about how to quit smoking." But behind the scenes, Democrats are watching this closely, with apprehension. Murtha is not the only name that has come up on the ethics front. There is an ongoing probe into the conduct of Rep. Charles Rangel (D-NY), the chairman of the House Ways and Means Committee. Among the allegations: his failure to pay taxes on income from a vacation home in the Dominican Republic. His use of four rent-controlled apartments in a Harlem apartment building. Charges that he helped a donor to City College's Charles B. Rangel Center for Public Service get a tax loophole in exchange for a contribution. Republicans, as expected, forced a vote to strip Rangel of his chairmanship, and, as expected, they lost. Speaker Pelosi has not backed away from her support of him one bit. Did I mention the former Democratic governors of New York, who resigned because of a prostitution scandal, and Illinois, who was impeached and removed from office amid allegations he offered to sell a vacant Senate seat to the highest bidder? And that the administration of the current Democratic governor of New Mexico remains embroiled in a pay-to-play investigation? We would still be talking about the indictment of Louisiana's Bill Jefferson (D) if voters hadn't ended his career in last December's runoff. And what about Sen. Chris Dodd (D-CT) and the mortgage deal he got from Countrywide? After the Democrats' big win in 2006, Pelosi promised she would "drain the swamp." She may come to realize, if she hasn't already, that neither party has a monopoly on integrity.